Hello, Re-Inkers! It's Andrea with you today sharing some love for Pretty Pink Posh. Seriously, though, I just adore their stamps and used three different sets on my card. 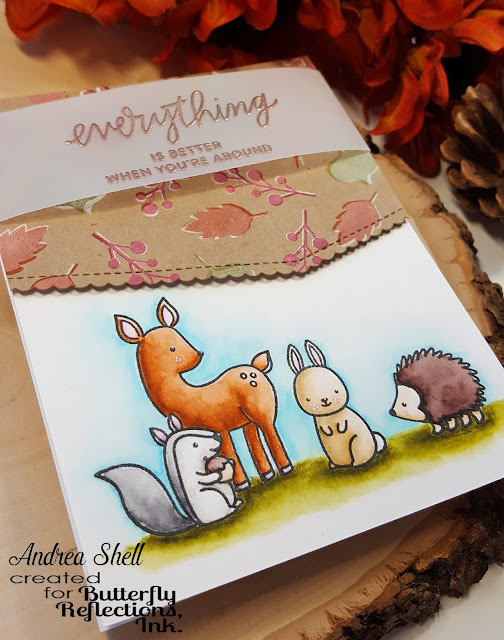 I started by stamping the adorable Woodland Critters with Versafine Onyx Black ink onto Bristol paper. To have the deer behind the squirrel, I created a mask with Stamping Mask Paper, placed it over the squirrel, and then stamped the deer. I colored all of my images with Zig Clean Color Brush Markers and a waterbrush. Once they were dry, I added some details with a white gel pen and adhered the panel to a white, top-folding card. For the top panel of my card, I stamped leaves from Autumn Blooms with white pigment ink onto kraft cardstock. Once the ink was dry, I stamped the leaves again with dye inks, off-setting them a bit to create a shadow. I die-cut the panel with MFT Stamps' Stitched Scallop Basic Edges Die-namics and then worked on my sentiment. That beautiful sentiment is from the Thoughtful Greetings set. Using my MISTI, I stamped it in Versamark onto a strip of vellum and heat-embossed it with copper embossing powder. After wrapping the vellum around the kraft panel, I adhered it to my card with foam tape. Thanks for stopping by. I hope you have a wonderful day! Oh my goodness ! This is such an amazing fall card ! These critters are irresistibly cute ! What an adorable card. I love the design and coloring.